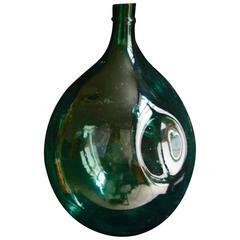 A very unusual pale green, dimpled demijohn distillery bottle. Great size and scale. I had a stopper made with an electrical light socket so that it could be used as a table lamp and takes a regular size light bulb. To use or not. Makes a great sculpture otherwise. 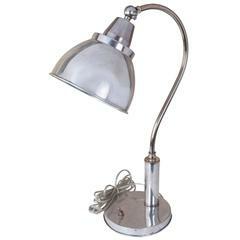 A mushroom-shaped chrome table lamp with rivets along the edge of the shade. Nice tapered base. Takes a standard base light bulb. European but rewired for American use. Offered is a gorgeous and welcoming, 1970s brass pineapple urn lamp. The lidded urn has been fully converted into a lamp and rests on a decorative ornate wood stand. New wiring. Perfect as a vase standing on the floor, adding character to any room. 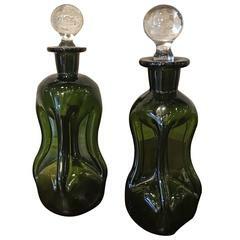 Pair of Mid-Century, dimpled, green glass perfume bottles with clear glass stoppers. Measures: Large bottle: 2" W X 2" D X 7" H. Small bottle: 1.5" W X 1.5" D X 6" H.
This handblown demijohn bottle with a crafted "dent" is a more unusual and decorative form than the plain variety. Made to store wine or water. Perfume bottle in punched glass, vintage of modernism, Le Muse series produced by Lalique Francia, with mark engraved on the bottom, circa 1970s.